Even as Jet Airways continues talks with investors to raise much needed funds, it is now facing credit rating downgrade in the wake of delays in stitching a deal. Local credit rating agency ICRA has downgraded its ratings on the full service carrier's various debt instruments to C from B (negative). The ratings have been downgraded for its non-convertible debenture programme (Rs 6.98 billion), long-term loans (Rs 49.70 billion), long-term fund-based facilities (Rs 6.45 billion) and non-fund based facilities (Rs 7 billion). The rating on Jet's short-term, non-fund based facilities (Rs 39.50 billion) has been reaffirmed at A4. The airline had a gross debt of Rs 84.11 billion at the end of September. “The rating downgrade considers delays in the implementation of the proposed liquidity initiatives by the management, further aggravating its liquidity, as reflected in the delays in employee salary payments and lease rental payments to the aircraft lessors,” the ICRA analysts said. 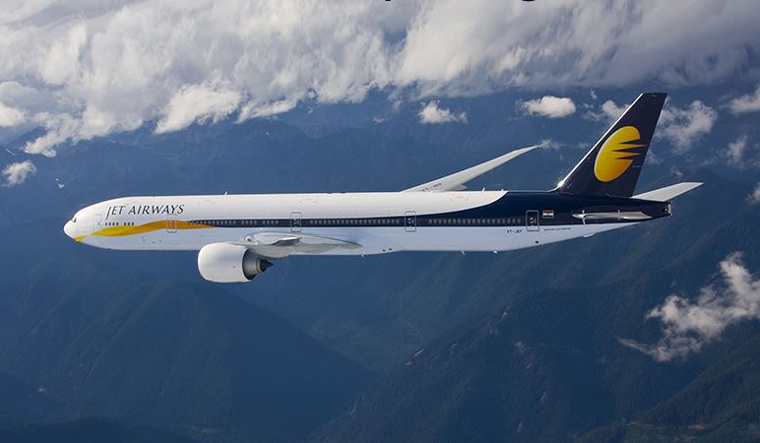 Important to note is that Jet Airways has large debt repayments coming up—Rs 17 billion between December-March, Rs 24.4 billion in FY2020 and Rs 21.67 billion in FY2021, the ratings agency noted. The full service carrier was hit over the last few quarters by a sharp rise in fuel costs, depreciation of the rupee and continued low fares in the industry. It has reported losses for three consecutive quarters. Tata Sons had recently said that there were initial talks over a possible investment in Jet Airways. Promoter Naresh Goyal has also been in talks with Etihad, which currently holds 24 per cent in Jet Airways and some reports have speculated that the Abu Dhabi-based airline may be ready to offer it a financial lifeline. Jet Airways CEO Vinay Dube had said recently that it was in discussions with various parties to secure funding. “We are in active discussions with various investors to secure sustainable financing to navigate through the current headwinds and create long-term growth. There is interest in our strong brand and confidence in our business turnaround efforts,” he had said in a letter written to its frequent flyers. As part of its ongoing efforts to optimise costs, Jet Airways earlier this week announced that effective December 21, 2018, people travelling in economy and booking light/deal/saver/classic fares for flights starting January 7, 2019, will now have to buy meals. On flights within India, all features and benefits, including complimentary meals, will continue for the 'flex' economy fare option and for all fare options in premiere class. All features, including meals will remain unchanged for international flights. The airline had also recently suspended complimentary lounge access to some of its Jet Privilege loyalty programme members. Jet, which has delayed salaries to some of its employees, has also said it will sell its fleet of six Boeing 777 aircraft and lease them back. The airline recently announced 18 additional frequencies on some of its domestic and international routes, mainly from its hubs, Mumbai, Delhi and Bengaluru. But, it is also learnt to have reduced frequencies on some of its other routes. While a decline in fuel prices and the appreciation of the rupee in the last few weeks, will come as a respite for airlines including Jet, ICRA noted that the industry still faced a weak pricing power and that would continue to pressurise company's performance in the near-term.